What is a cool tie? It's a neck band which has water-absorbing polymer crystals inside of it. When you submerge your cool tie in water, the polymer absorbs the water and swells up to form a soft, comfortable gel. It acts like an evaporative cooler (also known as a swamp cooler) to help beat the heat on those terribly hot days. When you don't need it, hang it up and it'll dry out as the polymer returns from a gel state to a crystal state. They then can be stored and reused again and again! These are the styles currently available in cool ties - 37 designs total right now. Designs will change due to fabric availability; as new designs emerge/old designs become unavailable, this site will be updated. All ties are $5 plus $3.95 shipping within the continental US; please drop me an email with your zip code/country if you're outside the US and want one, so I can calculate shipping costs. Use the name listed under the large image of the tie you'd like for ordering purposes. Remember, all colors display differently on different makes of monitors. I've tried to make these as true to life as possible on my monitor, but they may not show the same way on yours, so I've included the descriptions as a backup. If you'd like to order one (or more), send a check or money order to Lori Fuller, C/O OCB Trading Post, 657 E. Arrow Hwy #M, Glendora, CA 91740. If you want to use an alternate payment method, or if you have any questions at all, email me - my email address is pixel@ocbtp.com . 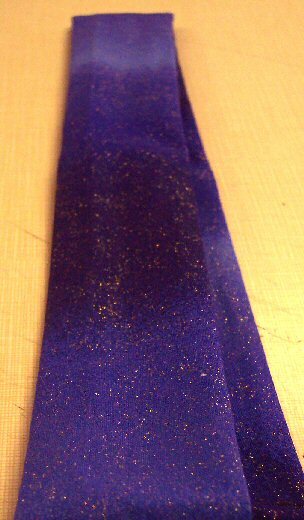 Fading from a medium to a very dark blue, this slightly glittered tie appears to have bands of color. This off-white tie's got black bears, both standing on all fours and on their hind legs, interspersed with golden yellow diamonds and an interesting background pattern. Bands of geometric patterns in yellows and reds cover this black cool tie. It has a slightly tribal feel to it. Rich, dark black cloth with some small rust designs - mostly triangles, circles, and other geometrics - scattered along its length. Standard blue bandanna cloth, but made into a cool tie! Blue flames burn along the length of this black fabric. Like the star panel on a flag, this tie features a blue background with off-white stars dotted along its length. I fell in love with this Indian corn pattern, and it looks awesome when it's around the neck. While this photo appears somewhat purplish, the color here is better defined as a delft blue, with a bit of glittering silver worked into the fabric. Eagles fly between the trees all along the fabric for this cool tie. Muted greys, beiges, blues and black make a wonderful eight-point quilt star on this fabric. Emerald mottled print, very simple and basic - but a rich green tone. Feathers lazily drift all along this speckled brown fabric. Almost jungle-like, these ferns are scattered across a deep green background. Rippling American flags make up this entire design. One of many types of camoflage fabric that I'm actually fond of, this batch of mixed brown and green foliage is actually a very pretty nature print. From a distance, this looks like a mixed grey print. From up close, though, you can see distinct circular bubble designs. Based off of a quilt design, this jeweltoned fabric is filled with color and life. A simple lavender calico print, with just a hint of pink to it. I've always liked the old TV show 'Northern Exposure', and this fabric reminded me of it for some reason. Green on green. There's no easy way to describe the pattern of this red print. It's a really nice, deep red tone, with an asymmetrical design to it. A variety of animal tracks are visible on this mottled goldenrod fabric. The base tone is a little darker than the yellow tie shown further down this page. A simple pink calico - but a very bright pink in shade. It verges on what I'd consider hot pink, but it's not overpowering... it's not a pink that'll hurt the eyes. A rich, deep royal purple which really just doesn't come out well in pictures, but which is a beautiful shade. There's just a hint of silver sparkles in this fabric, but it highlights rather than distracts. Like a good, old-fashioned patchwork quilt, this print has a variety of designs. It's colorful, but most of it is muted, calm colors. Same design as the blue bandanna, but in a bright red. Styled like Seminole-style patchwork, this print is filled with vibrant colors and geometric designs. Based on some of the patterns normally used in Southwestern art and decor, this fabric has bands of geometric design on a mottled tan background. It's like staring into the night sky - hints of midnight blue, lighter patches which could be clouds, and the occasional sparkle from a star. Your basic mottled tan fabric. The print has a leathery look to it, but not the feel of leather. For some reason, this reminded me of a piece of African tribal artwork I've seen at some time or another. It's a nice variety of neutral blacks, beiges, browns and a hint of green and rust for contrast. There's got to be a name for this specific type of print, but I've never figured out what it is. Regardless, this is a beautiful green turquoise fabric with a bit of a blended crosshatch pattern in grey tones. A vibrant, deep blue turquoise shade, accented with just the slightest hint of silvery sparkle in the fabric. The foliage on this fabric design reminds me of plants just barely coated with winter snow. The background is a blue so dark that it's almost black, and it highlights the plant design very well. Your basic, slightly mottled goldenrod yellow. This is about as generic of a color as I tend to lean toward, but it's such a pretty yellow that I had to try it. Don't ask me where the fabric name on this one came from, but that's what they actually named this design. It's a rich, rusty red tone with an abstract patterning, but it's not overwhelming - in fact, it's rather pleasant to look at.